I recently expounded on what I want to do with my life, whilst in gchatting conversation with Kathleen, frequent guest star of Words to Bumble. I think ideally, I’d like to work part-time from home and part-time in an office with snacks and a view. I don’t know if you’ve heard: I hate the F train. And here is yet another reason for my hate of said train. Let’s take a look back at my Friday evening, shall we? It was not a good night. Much of that blame lands on the F train, although to be sure, a good portion must be allocated to the spiteful cosmos. First of all I was feeling a bit off on my way to happy hour in midtown. When the place we wanted to go was packed with a million hour wait, Kathleen, David and I decided to head alllllllll the way uptown to their ‘hood in the hopes of wider drinking pastures. There were still waits. It was inevitable. Friday was a gorgeous day: hot but dry with a breeze—perfection in the summertime. And so we waited there—way up there, above 100th on the west side. And then I began to feel more than a little nauseous. To quote Lucille-Two, I sensed the “dizzies” coming, soon to be followed by a departure from consciousness on a Manhattan sidewalk. I chose another way, only slightly more dignified: I tottered over to a low, filthy marble stoop and sat with my face on my knees. At one point, despite sitting down I was hit by yet another urge to leave the world behind. The street before my eyes dimmed, the sidewalk appeared to rock back and forth. Kathleen looked worried. David continued to bargain with the hostess a few yards away. Once that wave of doom passed, I wondered if it would be worth getting up, walking back to the front of the restaurant and allowing myself to collapse right there. I mean, that would merit expedited seating, don’t you think? What does all this have to do with the F train? Just wait for it. 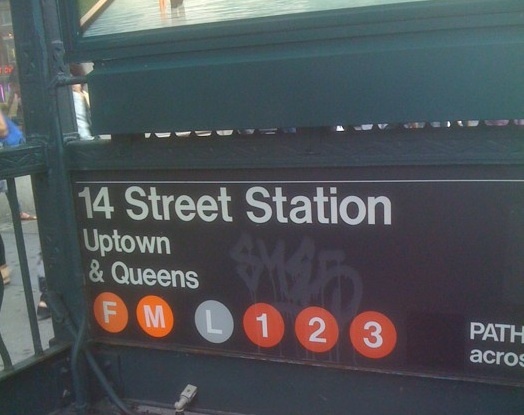 The F train is Act II. As you may have astutely inferred, I never got to have my margarita. Other people had margaritas and nachos. I had diet Pepsi and water. And some rice. After holding down our table for as long as possible, we headed back to a couch since clearly I would not be going out further that evening and was not yet ready to suffer the subway ride home. At midnight, I toddle down to the 1 train. Despite inordinately loud and never-ending track announcements, my 1 train experience was lovely. The train came almost immediately and even though they were power washing (story of my life) at Columbus Circle, all was not bad. The D train came right along and I slipped into a coveted seat. And then it happened. We pulled into 34rd street I suppose, just as an F did the same. There I am all pleased with myself as the train leaves West 4th. Then there I am wondering why we haven’t stopped yet. And then, there we are pulling in to the C-E stop at Spring Street. Not Broadway-Lafayette. Not Second Avenue. Not even Spring Street on the 6 track. Spring Street at Sixth Avenue. I almost died right there on the train. Luckily, I managed to scramble out in an effort to minimize my disaster. There was nothing for it. I started to walk. Did you know that the walk from that stop is nearly two miles to my apartment? Recall that it is now 1 a.m. on a night during which I have already nearly passed out multiple times—due to not the slightest debauchery, I assure you. I was haggard. I was gray. I was dragging my corpse-like body through territory far too trendy for me to have had to deal with in that moment. Heels were clacking, lines were roped off, I was cranky. Why, you might ask, did I not take a cab? Because I am poor. That is why I have a blog. Obviously. If I was gainfully employed, would I have time to watch nearly every World Cup game and generally rant here all the time? No. I would not. I love the Marx Brothers. My family may or may not own two box sets of their movies… Kathleen did not get the reference when we had our day at the races last weekend. Anyways, Kathleen, Molly and I set out last Saturday morning on a journey back to fair Nassau County. Kathleen and I had a previous journey to that far land once before. Due to LIRR budetary issues, the train system does not usually go to the Belmont Station. Instead you have to take the train to a neighboring town and then catch a shuttle to the track. No such rubbish for Stakes Day. On Stakes Day the LIRR thankfully runs special service all day to the Station at the track, which interestingly feed directly into the facility. I mean, you end up right in line to buy tickets and enter the stands. It’s kind of magical. We moseyed over to the trackside grass, staked a spot with our blankets and hunkered down for the day. In case you didn’t know, unlike other tracks (such as Saratoga apparently), at Belmont general admission attendees get access to a strip of lawn that runs along the end of the track in front of the stands seating. 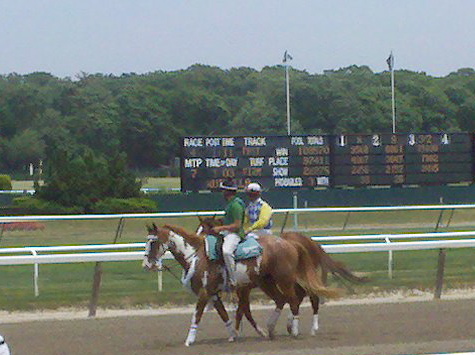 So you know, later in the day we were standing about 20 feet away from the Stakes contenders. Here’s the thing about the race track, it’s a basically a picnic with live but intermittent entertainment. At the baseball game last weekend we missed things because we would be chatting and socializing. At the track, you only have to pay attention for brief pockets of time. Very exciting ephemeral moments of madness. I went on to win for the win two races in a row. If only I had bet that I would win on two consecutive races, right? So shout outs to D’Funnybone and Proviso for winning their respective races. It was very exciting. I was hooked. You know who I hate? Roommate Molly won $40 on a longshot. Yes. She bet one dollar on a horse chanced 40-1. And she won on Champagne D’Oro. This was also her first time betting. Her first time at a race track in fact. 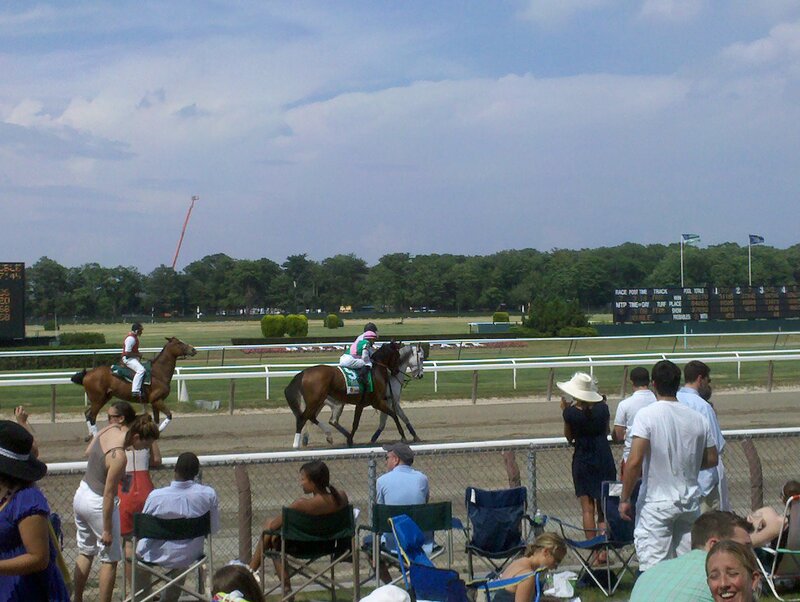 Quite the day at the races. Then, another friend showed up, another one who had never been to the races before and he put down a random bet for the Stakes on one of the most unassuming horses in the field, Drosselmeyer. This was after he had bet on a long shot when he first arrived and won with 20-1 odds. Lucky people I roll with, no? Anyway, it wasn’t all a loss for on my end. A horse I had selected to show came in second, so I made back some cash on that. Thank you to Fly Down for placing. You’re a star. All in all, I think I broke about even, which is fine. Plus Molly decided to treat everyone to a tall boy with her winnings, so that was kind of a win-win situation right there. And Sam drove us all home so we didn’t have to face the LIRR full of drunken trackies, so again, a win-win versus their actual cash winnings. Furthermore, I know have all these people hooked on the race track and I plan to go back all the time. There’s twilight racing next week—who’s with me? Oh, and new Word of the Week: “Buddy Horse” is my official term for… the buddy horses that accompany the racers during the parade to the gate. I don’t see a better term for designating these supportive friend equines. I love buddy horses. They support the racers and I like to support them. I like the grey and the paint ones best. In case the title had you worried: Never fear, there were mint juleps as well. Take a deep breath. 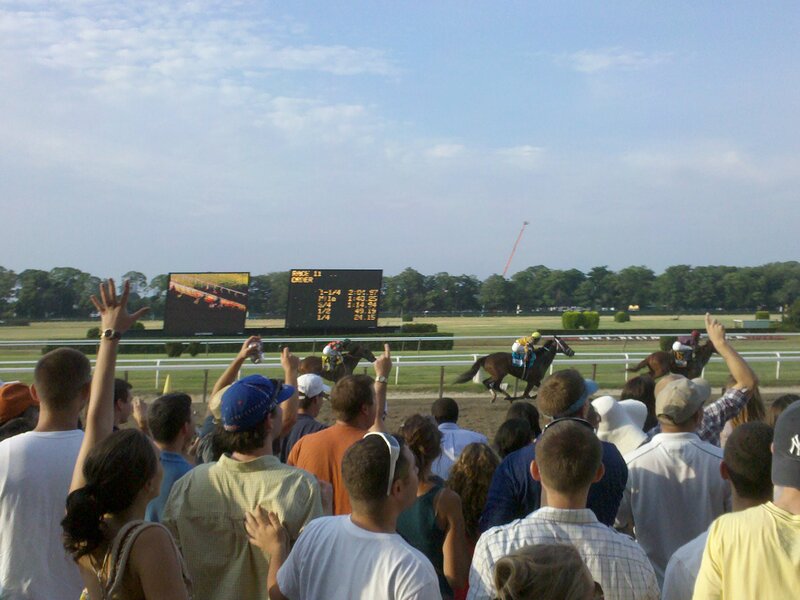 As a kid I spent what felt like a fair amount of time at the Belmont Race Track with my family. One of my uncles was working there at the time and I loved horses like a great many little girls are wont to do. I read kid fiction about horseback-riding gals, I stole souvenir Belmont glasses from my grandmother, and I demanded that every vacation involve a jaunt on a horse since it had become to clear to me early on that never would my parents actually purchase me a pony. It is a sad reality with which many children are forced to make their peace at one point or another. As the years went on, my uncle no longer worked at the race track, the juvenile fiction became predictable (though always ever so inspiring and tear-jerking), the glasses broke and my family started kayaking on vacation instead. My love for horses and racing sports persevered over the years, despite my failure to be capable of reaching great speeds myself, with or without the help of horse. Racing sports are the best because you get can pick one or two random names to back if you know nothing about the field, and unless you are into marathons the action is immediate, brief and thrilling to the end. Perfect entertainment. 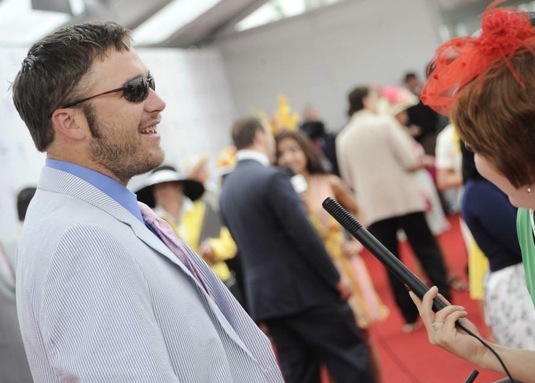 In college I met Kathleen who has spent a fair amount of time at the race track in Saratoga and owns more than one appropriate hat, much like Johnny Weir. Match made in heaven? Yes. 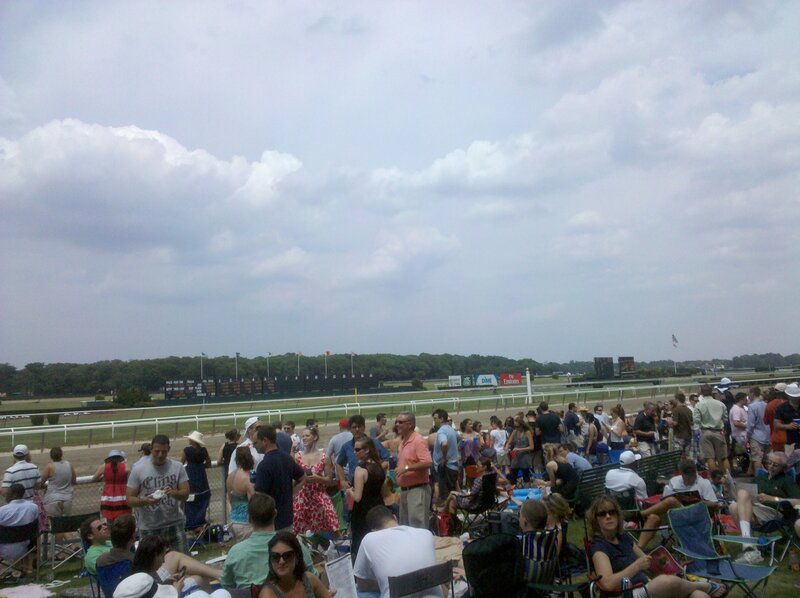 We set out Saturday afternoon to enjoy the day and the Derby from Manhattan. We ended up at a random sports bar not far from Washington Square Park called Reservoir. We settled in directly in front of a prime plasma screen, ordered ourselves a couple of mint juleps, persuaded the bartender to set the television to the derby before any one else had shown up for the race and proceeded to wow fellow barflies with our knowledge of Derby procedure. It did not take a lot. It also did not take a lot to make them commence in their judgment of us as crazy girls. I think it started when Bob Costas– everyone’s favorite sportscaster– appeared on-screen. We might have screamed, “Bob!” People might have turned and stared. But it mattered not. The question at hand was how could I have ever forgotten to depend on Bob Costas to appear for a high-profile, obscure, rich man sport? If only it had been possible to hear what I am sure was insightful, winning and profound commentary from The Costas. Instead, we had to resort to pondering why he appeared to be holding court in a rec room where people were playing pool and generally looking utterly unaware of the élite happenings out in the weather on the track. It wasn’t just us– everyone was wondering why Bob was sitting in a fluorescent basement. As I recall he may have escaped just before the race for the roses; however, by then we had a whole new set of problems unrelated to the producers of derby coverage. Our new problems were embodied in the person of a Mr. Sullivan, a middle-aged man with poor vision and a few thousand dollars running on a horse that did not win. Luckily, Sullivan had grown up in a betting family and he had strategy that involved betting on a variety of horses and placements. I have no real concept of how such things work, so I’ll leave it at that. Anyways, Sullivan decided to join our table right below the plasma because he had apparently forgotten to bring his glasses. So we sat, we drank and we chatted with the man three sheets to the wind. He was a little wobbly, his drinks had a tendency to slosh over the sides and he told us many of tale of his gambling youth. In the end he was generally harmless, if a mildly irritating interloper who invited us to return to the bar for the Preakness. So now you know where to find me later this month. Clearly. Care to join? Also, in the never-ending list of Olympian perks… a handful of Vancouver competitors put on white suits and wide-brimmed hats to celebrate what Bob Costas has refereed to as an iconic element of Americana. 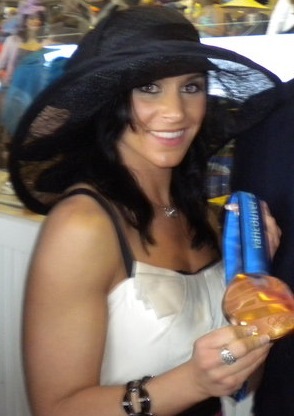 Short track speed skater Allison Baver donned a wide-brimmed black number, although not quite as wide-brimmed as Johnny Weir’s. Bode Miller unsurprisingly was not wearing a hat, but did go for a festive white Derby Day suit. Also, not that tiny red feathered situation being rocked by the lady with the microphone, as a sidenote. Olympians get invited to the best stuff. 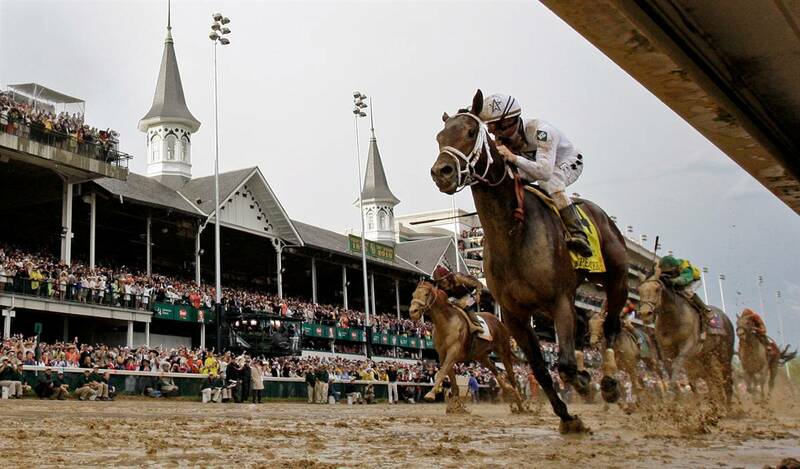 One of these days–despite our non-Olympian, wealthy Southern or movie star statuses– Kathleen and I will go to the Derby and we will wear hats and it will not rain and Bob Costas will not waste his afternoon in a basement. In the meantime, I have a gambling buddy for the Preakness and plans to go to Belmont for the Stakes. Oh and in case you were wondering and had not yet figured it out, my horse Devil May Care did not win, but Super Saver did. 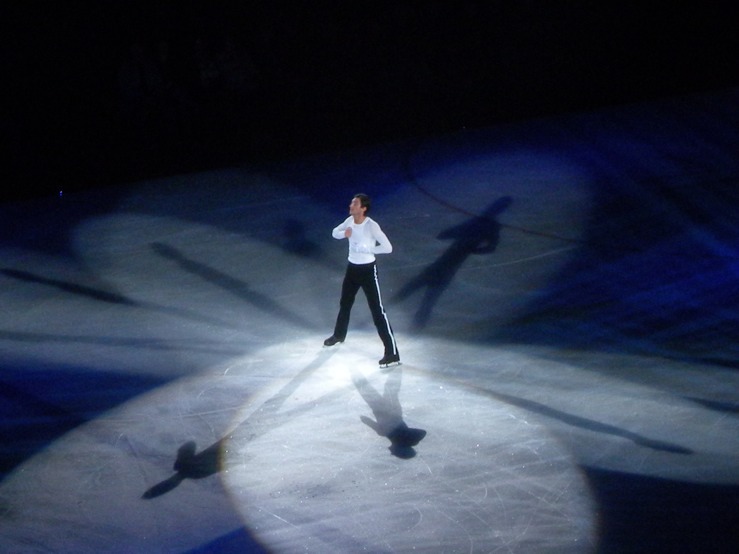 These days there is only one national tour allowing enthusiasts to see their favorite figure skaters. The Ice Capades folded in 1995 after over fifty years of kitschy entertainment, Champions on Ice went out of business in 2008, and Stars on Ice is the last tour geared towards audiences looking for competition style skating rather than novelty shows aimed at children (i.e. Disney on Ice). Not that this prevents a certain level of highly entertaining kitsch. There are group numbers with loads of sequins and outrageous Star Search lighting during which tour members flit about to the likes of the Black Eyed Peas’ “I Gotta Feeling” and “I’ve Got the Music In Me” (Kiki Dee Band), among other selections that will make you giggle, including one number incorporating a giant disco ball for extra fun. It is also vastly entertaining. Vastly. At the risk of sounding a touch over-excited: There is nothing like seeing Olympic athletes perform in person. Truly. Especially when you have your own personal Scott Hamilton (read: Kathleen) to comment, gasp and clutch with you. After the opening group number, the show began with Mirai Nagasu skating a version of her competitive short program to music including “He’s A Pirate” from Pirates of the Caribbean (I told you there would be multiple instances of pirates after the golden dollar debacle). For reference, this is the program during which she spun so fast at the Olympics that she got a bloody nose on the way to a fourth place finish in Vancouver. Mere weeks later it was the program that garnered her a personal record at the 2010 ISU World Championships and first place going into the free skate with the break out performance of the competition. Nagasu is purely delightful, the girl is going places; like she says, “I just want people to know that I’m the future.” Her signature grace on the ice came across even in the upper levels– sprightly footwork, fluid lines and unrivaled spins were a joy to witness in person. One might think that watching the same program for the fourth time [after televised coverage of Nationals, Olympics and Worlds] would have been old hat, but it was nothing of the sort– if anything, I just knew what I had to look forward to from the moment she stepped out onto the ice. Suffice it to say that seeing what Nagasu can accomplish in the coming 2010/11 season will be terribly exciting, and I look forward to watching her show the world what she is capable of. The unfortunate thing about Abbott is that as delightful as he is when he is on, he clearly tends to succumb to nerves after even a minor slip up. During his second solo on the ice Abbott had a few issues and touched down on the ice once or twice, never seeming to recover from an early issue. Comment from Kathleen: “That boy really knows how to swivel his hips.” This is why she is my own personal Scott Hamilton. Incidentally, Stars On Ice was founded by Scott Hamilton when his Ice Capades contract was not renewed in the mid-eighties. 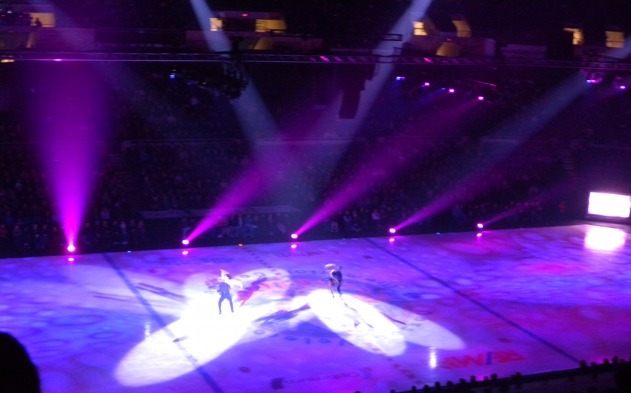 Olympians Meryl Davis and Charlie White skated their Indian original dance from the 2009/2010 season. Theirs was one of the few at the Olympics that was not entirely scarring, and its energetic pace definitely translated well as a piece of entertainment to keep the show going. Their crazy lifts (like the one where Davis stands on the back of White’s calf) are responsible for my growing enjoyment of ice dancing, which I often find to be a bit trying, frankly. Tanith Belbin and Ben Agosto gave a narrative performance to Jason Mraz’s “If It Kills Me,” telling the story of a relationship over the years, from childhood into adulthood, complete with props and multiple costume changes. It was pretty adorable. One of the most distressing aspects of the evening was the low energy of the audience. It was pretty obvious that the lack of enthusiasm was dragging on skaters throughout the evening, most notably Alissa Czisny’s second solo, “I Like the Way You Move,” which should have been a particularly high-energy number. Michael Weiss on the other hand was particularly adept at connecting with the audience with a rocking crowd-pleaser performance of “Keep Your Hands to Yourself,” complete with my favorite thing ever: back flips! There was clutching, there was gasping, there were joyous exclamations with each jump– and it was not just Kathleen and myself–everyone was loving it! I always miss back flips, I think there should always be more back flipping– it just brings joy. However, the ultimate crowd favorite was Olympic champion Evan Lysacek (and how relived am I to be writing about his figure skating skills again instead of Dancing with the Stars!?). I had wondered if he would perform the date that brought him to the dance. He did not, but what he did was amazingly fabulous. Picture this: the crowd goes insane when “our” Olympic champion is introduced. He appears on the ice… Is that a singular sparkling glove that he is sporting? What are those dulcet tones that I hear? Oh, Michael Jackson? Oh, “Man in the Mirror?” Yes, please. I die. So much joy. Just… watch it. Do yourself a favor. Try to be cranky after that. As you may surmise, clutching ensued. That was one of the most entertaining things I have ever seen. And they say Lysacek is boring and mechanical. Did they not note the glove? 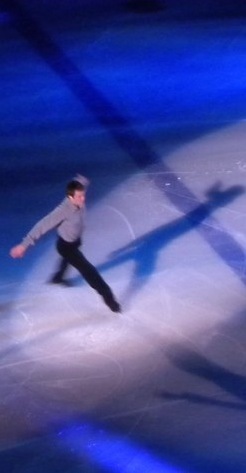 Sheer joy aside, the one thing I took home from watching Lysacek skate is that he is one tall man. It never really came across to me while watching televised events, but seeing him in person– I repeat– that is a tall man. 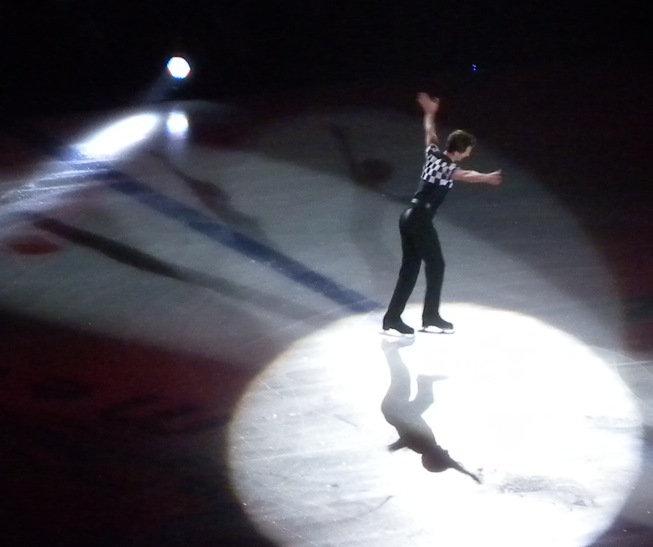 He towers over other skaters, even alone on the ice his height dominates, which may be part of why he is so impressive. So says Kathleen. The ever delightful Todd Eldredge: Discuss the fact that Eldredge has been skating since I first started watching… and he is still awesomely at it. Yuka Sato has been on the tour for several years and is also Jeremy Abbott’s coach, so this has been an interesting little exercise for them figuring out how to tour together as colleagues rather than coach and coachee. 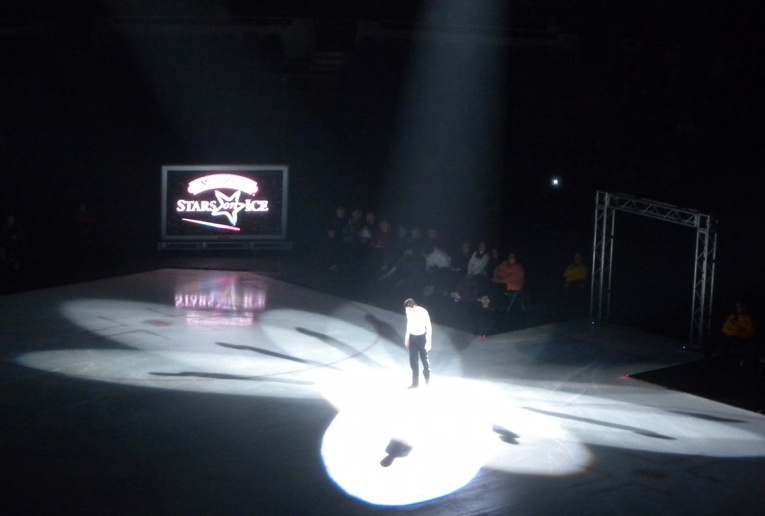 Lastly, Sasha Cohen skated as the only survivor of Champions on Ice. Apparently in the figure skating world, the dissolution of previous ice tours and the dominance of Stars On Ice is chuck full of drama– drama for another time perhaps. All in all, it was a very enjoyable experience. A little bizarre, a little campy, but also fantastic. There was a little something for everyone: classical pieces, pop programs, campy musical theateresque group numbers, Olympic caliber programs from the faces the world learned to love in Vancouver– overall good times. Plus, when you have gotten used to sitting through an entire night of compulsory dances, the variety brought the best of the best into one whole. So if you have ever pondered trekking out to see a figure skating tour, I fully recommend the experience. If you cannot make it out: check out the gallery of additional photos from the night on Long Island. That title is a cliché, but when you travel with Johanna and Kathleen these things just tend to be true. Mildly disastrous, terribly hilarious, but true. 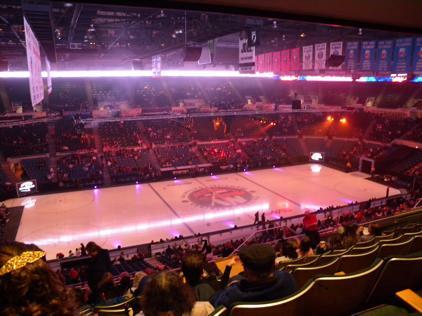 Over the weekend, we journeyed to the Nassau Coliseum (true story, home of the NY Islanders) on Long Island. Why? 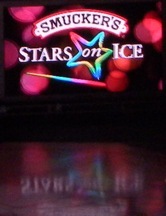 Far too many people asked us that question over the course of the evening, and far too many times did we inform judgmental strangers that Smucker’s Stars on Ice was our destination. Just to be safe, I thought I would really hit the fact home here and elsewhere on this great internet. Smucker’s. Stars. On. Ice. Excellence. …And then came the sound of a slot machine. 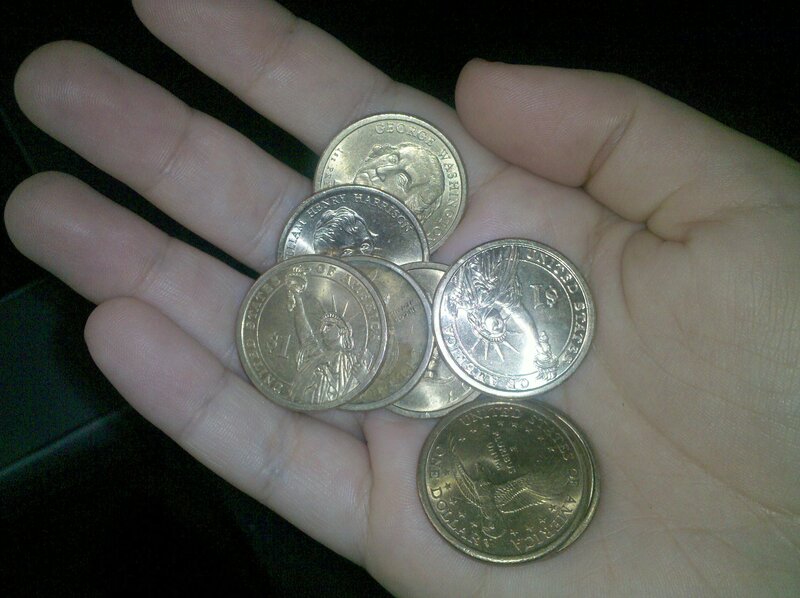 I got my change in the form of fistfuls of golden Sacagawea dollar coins. And that is why I generally use a debit card. It was not to be the last pirate related incident of the evening. In fact, one might call it foreshadowing. So we romantically shared a sandwich on the train in a weird little cubby hole seating compartment, read a few old Sports Illustrateds (I was really wondering who won that final USA/Canada game), and pondered what sort of folk would be in attendance at the Nassau Coliseum. We were figure skating performance virgins. So we strolled up to Old Country Road and took a walk. People driving past probably stared. 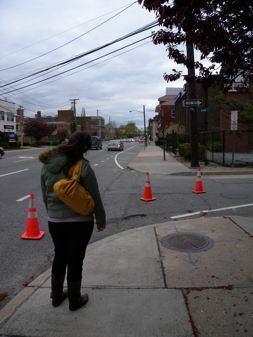 We saw maybe two other pedestrians over the course of thirty minutes. 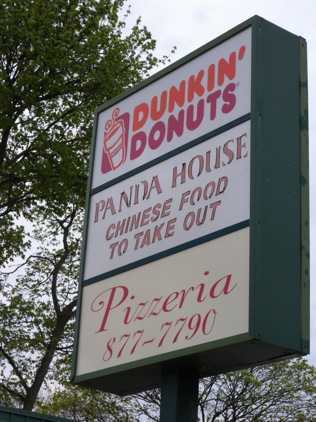 Along the way we discovered that David could live happily in the suburbs, based on the culinary offerings available on the single road that we encountered. Upon arriving at the mall–where we had dreamed of finding a Target–we realized that we were never going to get to the venue on time. We also noted that the last time we had seen a taxi was at the train station. I would like to take this moment to thank my Motorola Droid for using GPS so efficiently to look up the number for a local cab company. You know what is difficult? Calling a cab to a suburban intersection. Locating an address on a suburban thoroughfare. Being those two girls who decided to walk to a suburban arena. Kathleen spent far too long on the phone attempting to convince the dispatcher to send a car to our intersection. She was treated to another conversation with the dispatcher when moments later she actually managed a feat of Olympic stature: hailing a cab on a suburban route. It was magical. The next magical thing that happened was the cab driver asking us what we were seeing at the Nassau Coliseum and then enduring his incredulous response when I explained that there was a figure skating show going down. He proceeded to laugh at us the whole way over our attempt to walk from the train station [in addition to probable judgment about the figure skating, which I repeat… judge away: You are missing out.]. Good question. So now Kathleen has Khan’s cell number just in case we ever need a cab again in Mineola, Long Island. 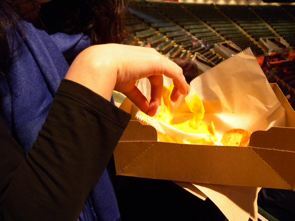 At the arena Kathleen procured her first fast food nachos since she was an almost elite swimmer, and we ascended into the nose bleed section. The floor was sticky, the lights were magenta, the air was crisp and life was becoming more and more complete. We settled in with a surprising number of middle-aged couples, one of whom was quite unpleasant and another who had luckily retained the enthusiasm of youth and squealed with us every time Michael Weiss did a back-flip. Fast forward to our return trip, since clearly the event itself merits a post dedicated completely to the splendor that was. The show ended fifteen minutes too late for us to make our train: 9:45. With the next train slated for 11:03pm, Kathleen and I set off into the night to find a snack and a way back to Mineola Station. 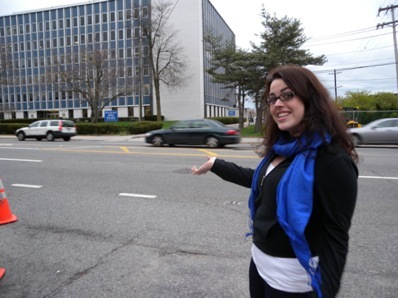 Conveniently, there is a Marriott directly across the parking lot from the Nassau Coliseum. Interestingly, there was an entire army of Asian flight attendants just checking in as we arrived in search of both a taxi and a snack. We wandered around the hotel for a while, encountered a vending machine (where I wanted to use a golden dollar from my stash, but Kathleen preferred to go the paper dollar route), and finally picked up a cab from the line out front. Our second cab driver of the night proceeded to joke with us about selling babies to China as cheap labor while cautioning us not to fall asleep in the car because we should be alert of our surroundings… it was creepy as all hell. We arrived at the station with forty minutes to kill. Since Kathleen had neglected to wear outer wear of any sort, we resorted to the local pub where imported draught beers only cost $2.50. After a Carlsburg, we finally got on the train. It was the wrong train with a terminus at Jamaica instead of Penn Station. Sinking feelings all around. Three things happened: First, we encountered the most adorable dachshund puppy on the train. Secondly, we got yelled at by the conductor for not having listened to the inaudible announcement. And third in the list of joy was sighting a pair of girls–probably 17 to 19 years old– pouring cheap chardonnay into big plastic cups on the train. They were on the wrong train as well and we rain into them again on the platform at Jamaica waiting for the next Manhattan bound train. We had a lovely chat about figure skating and were even invited to partake in the wine. We declined because, after all, it was probably difficult for them to procure that alcohol and we were heading straight to a cocktail on the other side of the river. Once on the train we had yet another conversation with people sitting across the aisle because we needed some insider advice on the Long Island Rail Road. It was confusing. They were from my Grandmother’s old town. They wondered why we were on the train. We told them that we were headed back in to the city rather that out into the city. When pressured, we told them where we had been. They stopped talking to us. When we got back to midtown, we immediately had ourselves a pair of hard-earned and well-deserved Long Island ice teas. Kathleen helms the our up and coming “Cooking Poor” video segments. She is also a frequent Words to Bumble guest star who find treasures in the subway and has issues with apartment rehabbing.